There are plenty of people who purport to be experts on the LC, after all it is one of the great icons of the 80s, and with a vast following too. One guy who is the real deal when it comes to such claims is Simon Thompson of East Sussex based 70s and 80s restorations, a man fast building a reputation for his high quality work. Simon literally lives and breathes the type having own, raced and fettled just about every model of LC from the original of 1980 version, to the last of the YPVS models. 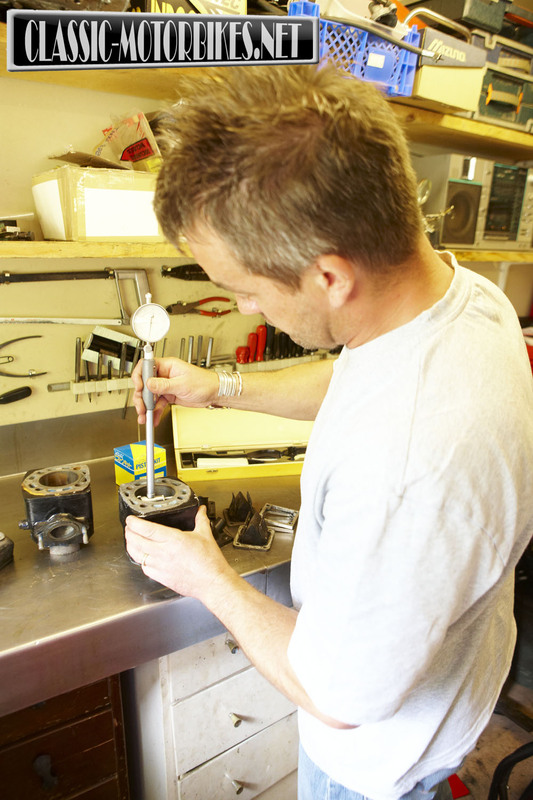 For the last ten years, Simon has been living his own dream, having switched careers to run his own business aimed at all kinds of work, from full and part restorations, to engineering and tuning projects. 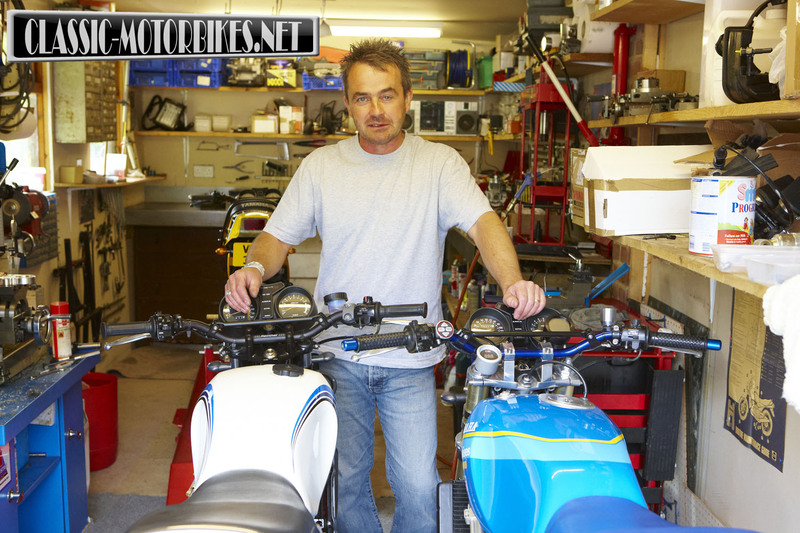 He works from modest sized workshop, albeit literally crammed with the tools and machinery needed to repair and create all manner of tasty modifications. “I started fiddling with cars at the tender age of 8” Simon explained “And soon developed a keen interest in modifying all kind of vehicles. This has given me the knowledge and skills needed to create the perfect restoration or the culmination of people dreams and ideas.” In the workshop sits a host of complete bikes, along with many parts awaiting work, while in the office sits a mint YPVS, placed just right so it can be looked at when the paperwork gets too much. Having started his biking career on a DT50M, before moving on to a RD125LC for a brief period, and then on to an RD250LC, Simon is a confirmed Yamaha nut. 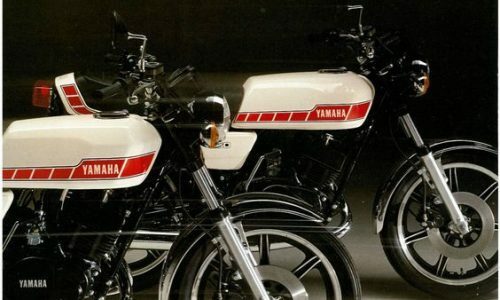 Incidentally, he still owns that same 250, but these days it looks a lot more like a 350, and a trick one too. 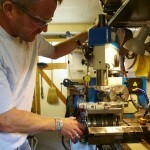 Simon adds “Basically this machine has been in my possession since I was 17, and in recent times it has served as a test bed for new ideas that in turn get passed on to my customers. It is very much still in development and constantly undergoing modifications in search of the ultimate LC. Currently, having been through many an incarnation, it sports a heavily braced frame and JMC swing arm, Ohlins rear shock and fork springs, and an RGV250 front end, with the whole lot sat on a pair of FZR400 wheels. The engine has been ported to race specification too and this all breaths through a pair of 34mm power jet carburettors and a set of Swarbrick pipes and is kept cool by a huge radiator taken from a Suzuki TL1000. To finish the job off, for now at least, a close ratio gearbox and straight cut primary gears ensures the maximum amount of power is transmitted to the rear wheel. Of course looking around this special machine reveals there to be much more than this brief specification and the machine literally bristles with all manner of impressive touches. 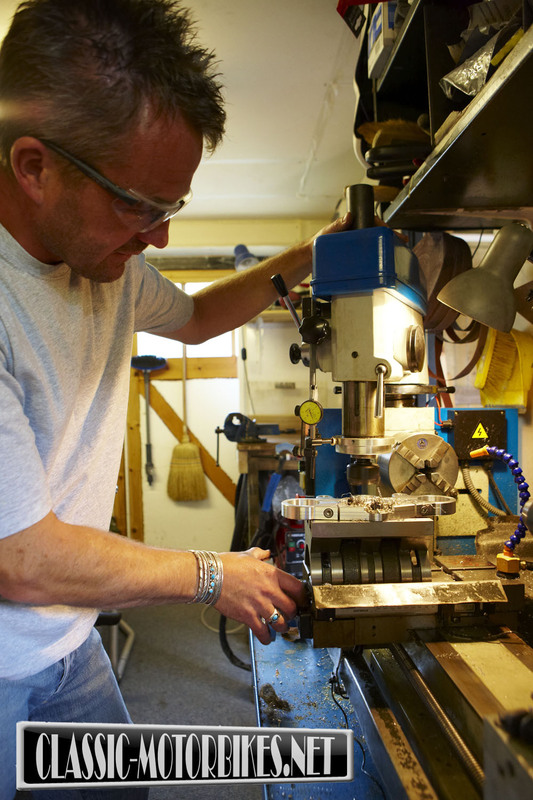 “A machine I have just completed was built to order based upon my own LC, a customer was trying to get me to part with mine, but there was no chance of that happening” Wayne recalled “Instead, he opted to have a similar machine built. That original creation was finished some time ago and, during 2009, the customer returned to me to have another built, this time based upon a special bought from eBay. As is so often the case, the machine looked great online, but once back at my workshop I soon spotted it to be a potential deathtrap, with little metal left attaching the rear end to the frame, and a similar tale to be told in the handlebar department.” This latest LC, resplendent in its Kenny Roberts paint scheme, left Simon’s just before the new year and then returned again once fully run in to be converted to run on 34mm Mikuni carbs. Some may get the impression that its LC’s all the way, although, as Simon and his website are quick to point out, his expertise isn’t limited to this breed alone. 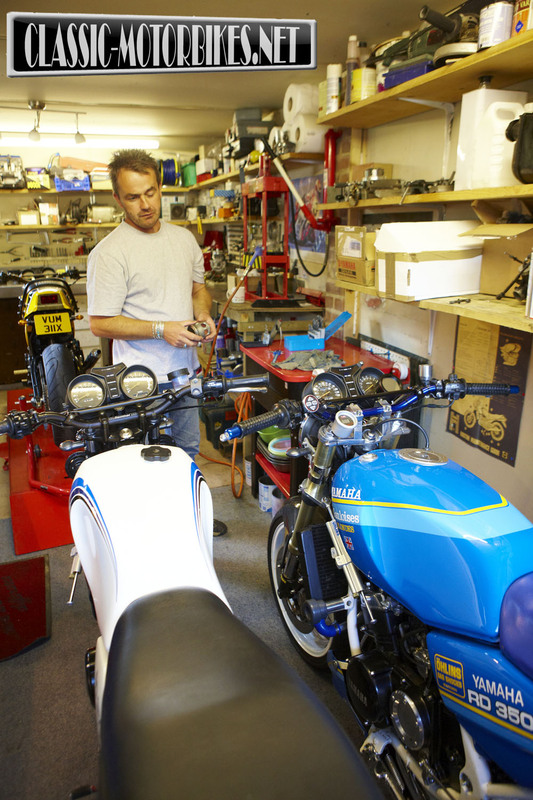 Indeed Simon has raced, worked on, and owned, many a four-stroke, and had already completed stunning restorations on a wide variety of machinery, currently a Kawasaki H1 and Suzuki GT500 are in the process of full restorations. 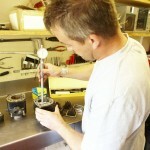 Simon’s attention to detail is impressive, and it is this, allied to his vast knowledge, that makes his work stand out. Clearly he is driven by the need to get every part just right, even on the inside of the engine, and parts that, most likely, will never be seen until the next strip down or blow up, Simon strives to get each and every bit looking and working great. Looking around the array of the customer machines currently undergoing work it is clear to see why Simon has built a great reputation and his clients keep coming back for more. 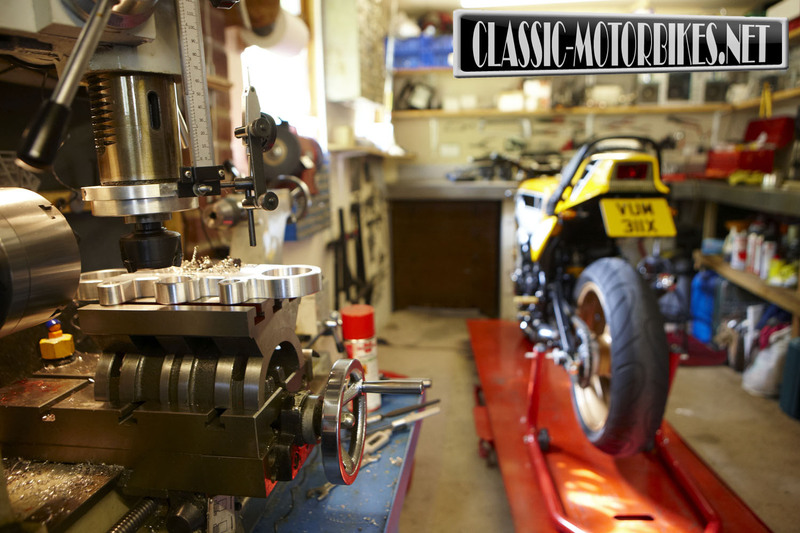 Simon claims to be able to do most tasks, and having spent some time in his company and looking around his comprehensive workshop and the superb bikes contained therein, I can only agree. Win a Triumph Bonneville T120R For Christmas!